This steering clunking sound is driving me insane! Thread: This steering clunking sound is driving me insane! I've been chasing this sound for weeks and I'm slowly zeroing in on where exactly it's coming from, but it is very elusive, intermittent, and not affecting performance at all, but it is a very noticeable noise which can't be ignored. it's a clunking noise I can hear when I turn the wheel between 10 and 2 o'clock, when i'm parked, car running. I'll hear a similar sound when i turn left while going over bumps. Pretty sure they're related. but weirdly enough, i don't usually hear it while driving. looked under the car, nothing out of the ordinary. took the wheels off, checked if anything was loose, all was good. checked the steering shaft by the brake pedal. the noise is definitely coming from directly behind the firewall in that area. but i'm not sure it's the rack and pinion itself; I was able to take off the dust boot and look inside with a flashlight at the spiral gear and the rack teeth and from what i saw it looked good. there is zero play in the steering. it has to be the joint connecting the rack to the steering shaft. Next I will see if i can inspect the other side of the firewall (there seems to be a rubber boot covering the linkage there) it got dark out so i'll do it another time. if anyone has a diagram of the parts that make up this linkage that would help me too. 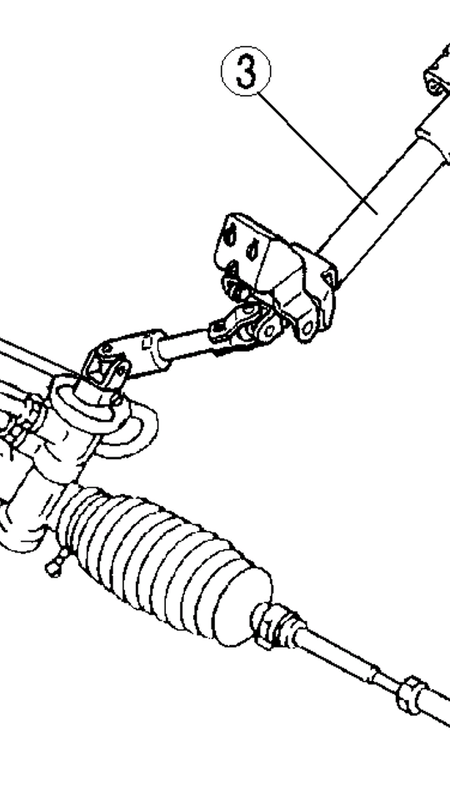 I know what it ISN'T and that's control arm bushings/balljoints, endlinks, sway bar, tie rod ends, shocks/struts/mounts, CV axles...a lot of that is new and i have ruled them out. if anyone has encountered this issue on their P5's and can shed some light onto wtf this is it would be helpful. Specifically, I want to make sure i'm not going to lose steering control while driving. thanks guys, this forum is very helpful, and I'm learning a lot. Last edited by wrathofpaul; 04-12-2018 at 08:49 PM. Could be the rack bushings, if it's not loose splines on the steering shaft. These are the bushings. Not cheap though. Maybe a U-Joint in the steering column. There should be one right around that area. I see 2 u-joints !;!! Last edited by pcb; 04-16-2018 at 10:16 PM. I'd put my money on U-Joints if I had to guess. Sounds like a pretty typical u-joint failure to me. Unfortunately it may be an expensive fix. I don't know how our car is broken down with service parts. Some cars you may have to buy the entire steering column. Some you can just get that lower shaft with both of the u-joints. You may be able to lube them and help it, but if there's that much play that it is clunking then they are probably beyond "lube and fix". Fuel-cut is driving me insane! HALP!